It was an honour to be asked to present the ColaLife Story at a conference in Geneva organised by Takeda on the subject of access to medicines. The presentation was very well received and was a reminder back to me of how much we’ve actually achieved and the hurdles we’ve overcome along the way. The presentation is embedded below with the full narrative. This is a quick-fire presentation with very few words per slide. For those reading this in their email, you can view and download the presentation from Slideshare here. The overall conference had a focus on non-communicable diseases. When I was invited to speak at this conference I was honoured but at the same time a little anxious. Although most people find the ColaLife story interesting we are not working with a Non-communicable disease. In fact we are working with a very infectious one – diarrhoea. The medicines involved are not complicated or on the leading edge of scientific discovery, but are very simple and classified as ‘over the counter’ in most countries. But here I am. And I’m here because the good people at Takeda strongly believe that some of the approaches and methods we have used have general appeal, and might be adapted and adopted to work with Non-communicable diseases. In particular, I’ve been asked to talk about how the ColaLife Innovation came about, “out of the box thinking” and how we have formed partnerships and worked collaboratively. Jane works with me full-time. She is my partner in life and ColaLife. Rohit is based in Canada and works with us part-time. He is our public health adviser. He designed our original trial and manages the monitoring and evaluation aspects of our work. He holds a Doctorate in Public Health from Johns Hopkins School of Public Health. The focus of our work has been Zambia but we are now starting to help others in other countries adopt and adapt what we’ve learnt in Zambia to their own circumstances. Child mortality is unacceptably high in developing countries. 1 in 8 children don’t make it to their 5th birthday. Just as shocking as this level of mortality is the fact that diarrhoea, an easily treated condition, is the second biggest killer. Dehydration from diarrhoea kills as many children as Malaria and HIV/AIDS combined. But it is not just about mortality. In sub-Saharan Africa 40% of children are stunted which means they are smaller than they should be for their age. 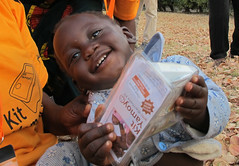 Diarrhoea is a key factor in stunting. If a child is stunted at the age of 2 there will be permanent effects on both physical and mental development. They will never reach their full potential. But we have known how to treat diarrhoea for more than 3 decades. It requires Oral Rehydration Salts (ORS) and Zinc. Both are cheap to produce and stable at ambient temperatures. The trouble is 99% of children do not get this treatment. But whilst you can buy Coke, and many other commodities, in the remotest parts of the world, you cannot get ORS and Zinc to treat a child with diarrhoea. While small community shops are well stocked with the things people want, the public sector struggles to keep public health centres stocked with essential medicines like ORS and Zinc. The last remaining barrier to children getting the treatment we know works, and saves their lives, is ACCESS. And so our idea was born. Why don’t we put diarrhoea treatment kits in Coca-Cola crates? The logic was simple: Coke gets everywhere. So, if we put diarrhoea kits in the same crates, they would get there too. The process of designing the anti-diarrhoea kit started here. We spoke to eight groups of caregivers about the challenges they faced treating diarrhoea in the home and we learnt so much. Firstly, litre sachets of ORS are too big for use in the home. ORS comes as a powder that needs to be mixed with safe water. Once mixed up it should be used as soon as possible and any solution still left after 24 hours needs to be thrown away as it gets contaminated. But a child will only drink about 400mL in 24 hours. So if you follow the instructions correctly you will throw away more ORS than you give to your child. Litre sachets of ORS were never designed for the home treatment of diarrhoea. They were designed for use in institutions – hospitals and clinics.. If you have five children lined up with diarrhoea it makes sense to make up ORS by the litre. The situation in the home where you are treating just one child is completely different and a litre is too much to mix up at one time. Measuring water is also a problem, in our trial only 60% of caregivers got this right. Caregivers resource-poor settings rarely have a litre measure and most will not know what a litre is. These focus groups also gave us an indication of what caregivers would be prepared to pay for a diarrhoea treatment kit and the caregivers gave us their views on various naming and branding options. As well as ORS, the kit contained Zinc supplements and so delivered the 12 year old international standard for diarrhoea treatment: ORS combined with Zinc. The kit also contained soap to help ensure hand washing. Before I go on to tell you what we did next, I need to tell you a little about our approach which is based on many years of international development experience. The foundation of our approach is that everything we do must be ultimately self-sustaining and this defines everything else. It means that we cannot become a permanent part of the solution. This in turn means that we have to do everything through local organisations and processes. So we have to work through partnerships. But partnerships come with a health warning. They cannot be any old partnership they must be “smart” partnerships. The task then, is NOT to set up parallel systems to do what these organisations are there to do, but to transform the way they operate together. The way we see this is as a “smart partnership”. Our role is to bring these players together around a shared vision NOT around ColaLife. When this job is done then ColaLife can withdraw and leave a sustainable, transformed local system behind. When we leave, we don’t want to leave with a bang, or with whimper. We don’t want anyone to notice that we’ve gone. Once we had designed our anti-diarrhoea kit – called Kit Yamoyo – we tested its distribution through the same channels used by Coca-Cola. From a standing start, in 12 months, more that 26,000 kits were bought by retailers serving these communities. Our baseline showed that ORS or Zinc was not available through the private sector before we started. Treatment rates with ORS and Zinc rose from virtually zero to 45%. We reduced caregivers’ need to travel to access ORS by two thirds; from 7.3km to 2.4km because ORS and Zinc was available in community shops which are more numerous and therefore closer to people’s homes. And finally, we increased the accuracy with which caregivers mixed the ORS due to the measuring functionality built into the packaging. However, our idea of transporting kits in crates did not work. What we thought was THE innovation was not the innovation at all. Less than 4% of retailers put the kits in Coca-Cola crates. In practice, this is what happened. 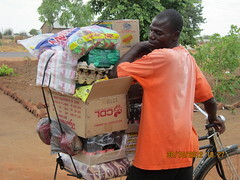 Retailers strapped kit Yamoyo to the back of their bicycle along with everything else. It wasn’t the space in the crates that was important, it was the space in the market. We had designed and marketed an aspirational product (just like Coke) which people wanted and which retailers could make a profit on by bringing it to their communities to sell (just like Coke). This is why the retailers bought Kit Yamoyo. They bought it and brought it to their communities for same reason they buy and bring Coca-Cola – because people want it and they can make a profit selling it to them. And everyone else in the distribution chain responds to this same motivation. This PULLS the product into the remotest of communities. For these value chains to work you must design a product that people WANT. To understand what they want you need to ask them. This process is often referred to as Human Centred Design. Generally this is not the way the public health sector works. Most health products and services are designed by experts on the basis of what they think people need. Although this has to be the approach for many drugs, I would argue that patient-centred design processes could be used a lot more than is currently the case. The big prize for designing a health product that people want, is that they are more likely to pay for it and, if they are, you can engage the existing private sector distribution channels to get it to them. You don’t have to set up your own distribution systems. This presented us with a very big problem. The world had signed up to the idea of kits in the crates. And we had won some very prestigious global awards. This is where business guru, Stephen Covey, comes in. He said that in business “The main thing is to keep the main thing the main thing” and that’s exactly what we did. We were in the business of saving lives not winning awards. At the end of the trial we ploughed all the learning into a re-design of Kit Yamoyo. This was aimed at improving the kit but we also had to drive out all subsidy. Nothing was exempt from this review. We even redesigned the much acclaimed packaging that fitted between the Coke bottles in a crate. Both of these maintained as many of the features as possible from the original design. In particular, the water measuring feature. We were even able to achieve this with the flexi-pack. Even though the screw-top was a better measuring device and could also be used as a mixing device, a storage device and cup, it was set to one side on the basis of its cost. With our scale-up design in place, we started marketing this new product in the same ways you would market any fast moving consumer good. This is the artwork for the billboards used. You will notice that ColaLife’s name is not there; we are invisible to the customer. As the production of the Kit Yamoyo flexi-pack got underway the manufacturer received a windfall order from the Government to produce a Government-branded version of the kit. It would not have been possible to respond to this Government order if production for the private sector was not already under way. The government version of the kit is the same as the Kit Yamoyo flexi-pack except that it had no soap and a different leaflet and so different branding. This is the first time that the design decision to carry the branding on the instruction leaflet had paid off. Being able to change the brand without re-designing the packaging was a huge advantage as this point. This is the production line. The same line produces the commercial Kit Yamoyo and the Government version of the kit. Note that the local manufacturer is producing the product for the market. They are NOT producing it for us (ColaLife). This means that the whole initiative can be self-sustaining in the long term. So things were going well. Private sector sales were increasing and the windfall order had been received from the Government. Then Zambia’s Revenue Authority ruled that Kit Yamoyo should be VAT-able because of the soap it contained. This increased the cost by 16% and given that affordability is so crucial, this needed a rapid response. This resulted in a new format for Kit Yamoyo – which was called Kit Yamoyo ESSENTIAL. ESSENTIAL was the same as the original Kit Yamoyo, but with no soap. So now, Kit Yamoyo ESSENTIAL sat alongside the original Kit Yamoyo. It looked very similar but was 19% cheaper. In response, the Kit Yamoyo manufacturer resurrected the screw-top and two weeks ago these started appearing on supermarket shelves. The screw-tops continue to carry the soap and so attract VAT. They are more expensive than the Kit Yamoyo ESSENTIAL, but they also look more expensive. It remains to be seen how well they sell and whether, other time, the ESSENTIAL will be seen as a refill for the screw-top. Let me finish with the 2016 sales. Here you can see the huge impact of the Government order on ex-factory sales. However, sustainability will come from growing the private sector market. Modelling done on our trial data indicated that we saved 3 lives per 1,000 kits used. On the other hand the case fatality rate for diarrhoea is about 1 per 2,000 cases. So, depending on which indicator you choose to use, in 2016 the manufacturer sold enough kits to save between 200 and around 1,000 young lives. Since Aug-12, when our trial started, the local manufacturer has sold over half a million kits. If you’d like to keep track of non-supermarket sales and the level of activity with community shops please visit our website where this KPI dashboard is published at least twice a month. Let me finish with some key lessons from our work which may be more widely applicable. Firstly, we must foster innovation because we need the step-change that innovation can deliver. The incremental improvement in health that we are seeing, particularly in developing countries, is far too slow and the health divide is increasing. Innovation in the health sector has tended to be synonymous with new products and treatments. But the emphasis needs to shift towards innovation in ACCESS to existing products and treatments. We now know how to treat most illnesses. The remaining challenge is to get these treatments to more and more people particularly in developing countries. In our case the access innovation was about commoditising an internationally recommended treatment which enabled us to use the existing commodity distribution chains to transform access. In other areas it might involve micro-credit or health insurance or something else. We must learn to fail fast and move on. To do this, it helps if you have a clear purpose. Innovations that are not delivering on your purpose should be put to one side. We have found it helpful to focus on WANT not NEED. This has particular importance in the commercial sector but even in other settings it’s better to strive to deliver what you KNOW PEOPLE WANT rather than delivering WHAT YOU THINK PEOPLE NEED. Any finally, strive to make the partnerships you are a part of smart partnerships. Partnerships in which partners gather around a vision not around you. Thank you to all the ColaLife funders past and present.